I didn’t put out a blog on Sunday, because I was in Wicklow. Which is very pretty. Look. No, I mean look, really. Isn’t this feckin’ gorgeous? While whizzing through what’s known as The Garden of Ireland, I had some thoughts. Wicklow is very famous in Ireland not just for tourism, but because the film industry tends to hang out there 98.7% of the time. For instance, if you were to ask my filmmaking other half where his office was, he would say “Wicklow.” “Oh, where in Wicklow?” you might probe. “All of it,” he’d answer (perhaps a little smugly). The reason for this is because you have all types of landscapes in County Wicklow, often side-by-side and in stark contrast with each other. Heather-lined mountains and steeply slanted valleys; trickling streams and thundering waterfalls; country castles and concrete terraces; century-old gardens and snowy mountain crags; seaside promenades and virgin forests. It’s got everything you need to film anything, basically, other than a major city, and even then you’re only 30 minutes from Dublin with a tailwind (and without a commuter pileup on the M11). Anyhoo, Wicklow is a successful tourist spot and filmmaking hotbed, I thought, because of its contrasts. And that’s what any successful creative project is, too. Be it a film or a book or a TV show or a painting, it has to have contrasts which lift it out of the mundane. The books and TV drama which hook me always have a balance of light and dark. The best comedy always has a few sad bits to balance out the humours (remember Del Boy taking the punches for Rodney around the time of his little brother’s wedding in Only Fools and Horses?). The very best tragedy always gives you something to snort coffee/wine through your nose at, if only to relieve the tension that’s been killing you otherwise (as just demonstrated by a masterful TV adaptation of Patrick Melrose). Similarly, the best books have always combined some sense of impending doom with moments of witty dialogue, light-hearted celebration and sometimes, downright slapstick. This is why I like epics and historical fiction so much: it’s because there’s room for all that and more besides. But I wonder why lots of major creative production teams don’t seem to get this. A painting or a book I understand, because they’re generally a one-person project, and it’s hard to balance out the humours sometimes when you’re the last person who’s going to understand the effect of your work. But TV shows and films involve tens or hundreds of people, including script editors who are not supposed to be the same people that wrote the scripts. Sometimes an entire team of people can miss the need for light and shade. I’ve lost count of the number of TV shows I’ve abandoned because I got no joy from watching them. The lack of joy is usually never because it’s tragic. It’s because it’s lacking contrast, and you’re stuck with just one feeling all the time: of foreboding, of impending doom, or even impending boredom at a rom-com that’s just one tired cliché rolled out into a hundred smaller, half-assed stereotypes. A while back, I did a couple of pieces after a run of particularly black comedy on Channel 4, some of which made me feel like I needed to wash the murk off myself afterwards. Some comedy is just too black. Similarly, some drama is just too dramatic. Froth can be too frothy, romance can be diabetic, and thrillers can turn into snoozefests because the characters are too predictable for us to care about what happens to them. More Wicklow. I mean just lookit. Pretttttty, even when the sun isn’t shining on it. But wait – what’s behind those trees?? It’s all the fault of the really good drama, to be fair. If we didn’t have really good books and films, we wouldn’t notice the bad ones so much. Killing Eve is a case in point. I recently started watching this murderous thriller romp, marvelling at all the little touches which were inessential to the plot but make it both entertaining and real (an assassin taking time out of her busy killing schedule to ruin a child’s ice cream treat! A foul-mouthed old French woman!). You smile, then your mouth drops open at the unabashedly violent death of a little boy’s grandfather. One to watch with all the family, obviously. And I remember the way Big Little Lies used a wise-cracking six-year-old’s music playlist to transition between unbearable tension and happy families. Genius stuff. Really. Unfortunately, Big Little Lies and Killing Eve made me think of all the other shows I’d watched that failed in that respect. There was Penny Dreadful (filmed, incidentally, in Wicklow) which, despite a cast of thousands of recognisable creepy figures from popular culture, managed to kill off Ferdinand Lyle, their one and only source of comic relief, far too early in what was in the end a very abruptly limited run. The Affair was another one I stopped watching after one series, realising that I had not even cracked a wilt of a smile once in the entire run. Its doomsaying thematic meant I had endured it, not enjoyed it. Even real life is not that gloomy all of the time. Anyway, one of the first things I learned in the study of English Literature was the concept of catharsis. It seems like a lot of today’s screenwriters could do with going back to school. Just a thought. 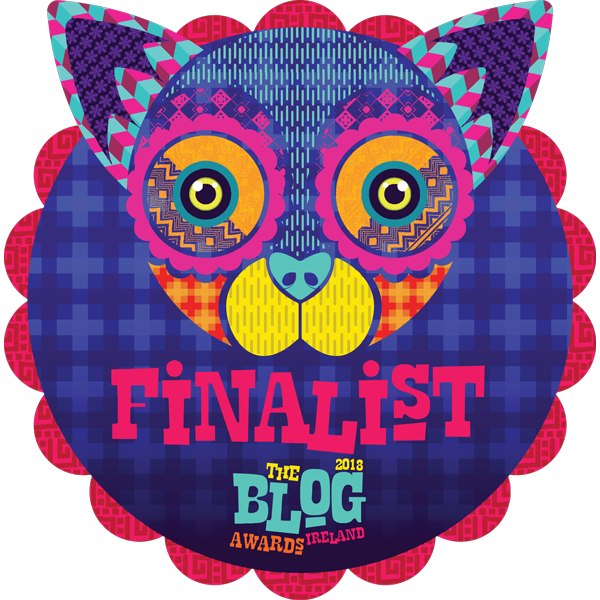 In other news, I have been Finalisted in the Blog Awards – imagine that! 5 years in a row! I’m either getting something right, or something very wrong. Given my propensity for black comedy, I’m not taking any bets. Anyhoo, it’s for the Books & Literature categories, and the Best Blog Post, for this post here – 10 Exciting New Ways To Get Offended Which Didn’t Exist 10 Years Ago. I’ll keep you – wait for it – POSTED as to how it goes. BOOM! BOOM!! Best of luck in the blog awards, let us know when and if we can vote for you. Watched the first 2 episodes of Eve last night and I’m hooked. That and Trust (Paul Getty) are the only 2 progs worth watching on TV. Loved the comedy and the dialogue in Eve – a cut above the rest. Just wanted you to know you have excellent taste as it is the same as mine. Congrats on the well-deserved Finalist status. As for your excellent points on screenwriting, I wish there was a Love button instead of the Like one. Couldn’t agree more! Thanks Nick! I mean it’s obvious I would know these things given my indisputably successful track record in screenwriting, yes?! No need to be one. Just because I don’t know the first thing about raising cattle, doesn’t mean I can’t tell a good steak from a bad one! Thad true. And at the rate I eat scripts, you’d think I’d have known. I too have left many tv programmes for the same reason although in comedies I don’t mind imbalance as much although now I think about it they do do tragedy but with comedy. Best of luck at blog awards. You going to Wexford festival this year? I sincerely wish I could respond to this post with some erudite observation about contrast, or even drop a hint I’d seen any of these so-called-English TV shows that I’m sure do not appear on REAL television over here in America. But no. All I can do is obsess about how some of your pictures did not come through when you posted this page. Especially the jpg you titled “sideboob”. I have to be honest. I’m really hoping to see that one. ::shrugs, spread hands :: So sue me. You named it. Oh dear. Do you not have a real internet connection, Will? You should get some real Americans to look into that. It’s a shame, because that Sideboob picture is entirely what you imagine and in no way a disappointment. I think I fixed it! View away. My WordPress app decided to have a fight with my phone. I’m sorry to hear that Liberty! You were robbed! Maybe after cake you could balance it out further with a revenge murderous spree plot? As usual, spot on. I’ve dropped so many Scandinoir ype productions because they are – in a word – dismal. No joy at all. Can’t understand why anyone would enjoy that. And then, to my delight, I found No Offence. Shockingly dark humour in the most hard-hitting crime show I’ve ever seen. My own books, as you know, lean to the comedy side. But even comedy needs tragedy, and in fact, I am of the firm belief that comedy is our way of dealing with tragedy without going batshit crazy. See you in the bat cave. You SHOULD visit, Anne! It should come as no surprise to you to hear I believe comedy is the most effective way of delivering uncomfortable truths – uncomfortable anything, to be honest… you get away with so much more darkness when there’s relief as well. Of course, being batshit crazy helps too! Congrats on making it to Finalist status, Tara. Btw, you’ve really got me interested in visiting Wicklow! Thank you, Jennifer. You should visit – it’s a must-do trip for most visitors to ireland! You make some very good sensible points, so much so I had to check this want some sort of guest post. But know, it’s Tarababy doing her shtick. I’m trying to avoid bingeing on Killing Eve so I spread the joy over a few weeks bit that is soooo hard. And I’ve struggled with some drama recently where the plots are so crassly edited that I assume i must have micro-napped and missed some link. Did you watch Fleabag btw? That’s funny, Geoff, because as soon as you mentioned that, I had to go and check I wrote it myself. Then I had to check that you were referring to the same post, but it felt a bit weird after I broke into your house and installed surveillance equipment, so I abandoned all further checks. I haven’t seen Fleabag and have long recognised it for gross negligence on my part. Do you know where it can be got? Defo on the beeb but in Ireland you may need to have a look at google play or YouTube. I’m sure it’ll be there though it may require a subscription. Mixes hilarity with wincing ‘did she really just say that’ with real heart breaking poignancy. And I’ve debugged you so no worries about the moths in your drawers. My drawers are grateful. However, the rest of me is a little concerned that you’re recommending non-compliant internet channels. Didn’t you used to be very legally minded… or am I confusing you with an aunt I knew once? Never conflate Aunts with Aren’ts in that I aren’t no lawyer. Well, I’m glad we cleared that up. It’s a start. As we approach October I’m definitely reminded of this. Many of my favorite scary stories understand the need to “bring audiences back to a midpoint”, to use contrast to reset audiences so that they are primed to feel another intense moment of joy, or fear. In many ways a good story needs to alternate between at least two tones, gradually shifting towards one more frequently and more intensely as the story approaches the penultimate climax. Absolutely true, Adam – words of wisdom there indeed. Let’s hope the right people are reading them!! Thanks for the re-blog, Traci! Thank you. Actually a very lovely lady from the Irish tourist board in cologne gave us the tip, blessings on her. We found the people wonderful, and have never seen such beauty as silver beach. As to your blog, like I said, I like the Irish people I have met very much, and, (I studied comp. lit) find that there is a particular sound flowing through Irish lit, a very high level of analysis linked to joie de vivre I also find in what you write. What a nice thing to say! Thank you so much – glad you like it! I remember years ago watching Magnum PI and thinking Hawaii looked just like Wicklow and then I found out it was filmed in Wicklow. I never knew that, Chris, which is surprising seeing as it must be absolute fact given the number of ‘taches visible in Wicklow to this day. If I said I just made that up would you say yes, I know you did? Of course I would. But you didn’t, so I won’t. My favorite show which got the balance right, every single episode: Firefly. I can rewatch it any time I want – for the language. Loved that show too, Alicia! I think if they brought it out today it would never have been cancelled – unfortunate timing. This way, though, it gets to be a legend. Not enough consolation, but the ‘verse exists – was never tarnished.